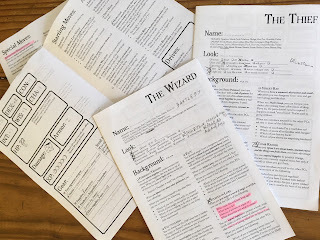 Homebrew World is the working title for my mini-hack of Dungeon World, optimized for one-shots and short-term campaigns. Most +1/-1 modifiers are replaced with advantage/disadvantage (roll an extra die, discard the lowest/highest). Parley is completely different; it’s as much an info-gathering move as it is a “convince them” move. Also: works on PCs. Aid and Interfere are rewritten as well. Aid is now “grant advantage but with risk” and Interfere is its own thing. Expendables (rations, bandages, etc.) are condensed into “Supplies.” Adventuring gear is now a combo of undefined "load" and expending Supplies. Ammo is tracked as a "status" on weapons/equipment. Shields give a bonus to Defend. Most “Special” moves are gone. Undertake a Perilous Journey is replaced with Venture Forth. I’ve included a couple of my favorite custom moves for speeding up play. There are only 3 debilities, and each affects two stats. But they’re easier to clear. XP and leveling are different, because this is meant for one-shots or short-term play. You get XP on a miss or when you Make Camp (instead of at end of session). An advance costs only 5 XP. You can burn XP to give yourself a +1 on a roll you just made. No more “big number” on stats, just the modifier. Likewise, HP is now a set number per class. “Race” is just part of your look. But everyone has a choice of Backgrounds, which replace the “race” moves and that give you a series of bond-like questions to use during intros. Drives instead of Alignments; same mechanic but less baggage. Many changes (some small, some big) within the classes themselves. There are two versions of the Fighter: one that's all skill and steel and guts, and the other (the Wielder) that's all about their special weapon. If I was going to be in charge of DW 2.0, this is a lot of what it would look like. 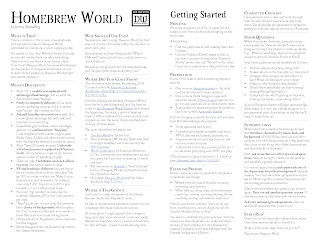 Homebrew World was largely inspired by Yochai Gal's One Shot World (which you should totally look at, too; it's free, closer to "core" DW, and the materials he includes for GM support are great.) It also owes a debt to Peter J, whose Dungeon World Quick Start Pack (no longer available) first got me thinking about this sort of thing. If you have questions about Homebrew World, let me know in the comments, via Google Hangouts, or by email (jack underscore blackfoot at the yahoo company). Likewise, if you play Homebrew World, I'd love to hear about it! Super cool! If I can't find an extant group to squeeze into I might try to use this as a gateway drug to form one. This is amazing! I love your work. Thank you for sharing it with us.